The authors would like to thank all of the participants who took part in this research for providing us very insightful and constructive comments, which helped improve this manuscript. The individual studies were supported by the following grants: Central Europe study: World Cancer Research Fund and the European Commission INCO-COPERNICUS Program (IC15- CT98-0332). France study (2001–2007): French National Research Agency (ANR); French National Cancer Institute (INCA); French Agency for Food, Environmental and Occupational Health and Safety (ANSES); French Association for Research on Cancer (ARC); Fondation pour la Recherche Médicale (FRM); French Institute for Public Health Surveillance (InVS); Fondation de France; Ministry of Labour; Ministry of Health. Saarland study: Ministry of Science, Research and Arts Baden-Wurttemberg. Aviano study: Italian Association for Research on Cancer (AIRC), Italian League Against Cancer and Italian Ministry of Research. Milan study (1984–1989): Italian Association for Research on Cancer (AIRC). Milan study (2006–2009): Italian Association for Research on Cancer (AIRC, grant n. 10068) and Italian Ministry of Education (PRIN 2009 X8YCBN). Italy Multicenter study: Italian Association for Research on Cancer (AIRC), Italian League Against Cancer and Italian Ministry of Research. Rome study (2010–2013): AIRC (Italian Agency for Research on Cancer), n. 10491. Swiss study: Swiss League against Cancer and the Swiss Research against Cancer/Oncosuisse (KFS-700, OCS-1633). Western Europe study: European Community (5th Framework Programme) (QLK1-CT-2001-00182). Boston study: National Institutes of Health (NIH) US (R01CA078609, R01CA100679). Los Angeles study: National Institute of Health (NIH) US (P50CA090388, R01DA011386, R03CA077954, T32CA009142, U01CA096134, R21ES011667) and the Alper Research Program for Environmental Genomics of the UCLA Jonsson Comprehensive Cancer Center. MSKCC study: NIH (R01CA051845). New York Multicenter study: National Institutes of Health (NIH) US (P01CA068384 K07CA104231). North Carolina (1994–1997): National Institutes of Health (NIH) US (R01CA061188), and in part by a grant from the National Institute of Environmental Health Sciences (P30ES010126). Seattle-LEO study: NIH (R01CA030022). Seattle study: National Institutes of Health (NIH) US (R01CA048996, R01DE012609). Tampa study: National Institutes of Health (NIH) US (P01CA068384, K07CA104231, R01DE013158). US Multicenter study: The Intramural Program of the NCI, NIH, United States. Puerto Rico study: jointly funded by National Institutes of Health (NCI) US and NIDCR intramural programs. Latin America study: Fondo para la Investigacion Cientifica y Tecnologica (FONCYT) Argentina, IMIM (Barcelona), Fundaco de Amparo a' Pesquisa no Estado de Sao Paulo (FAPESP) (No 01/01768-2), and European Commission (IC18-CT97-0222). Japan (1988–2000 and 2001–2005): Scientific Research grant from the Ministry of Education, Science, Sports, Culture and Technology of Japan (17015052) and grant for the Third-Term Comprehensive 10-Year Strategy for Cancer Control from the Ministry of Health, Labor and Welfare of Japan (H20-002). IARC Multicenter study: Fondo de Investigaciones Sanitarias (FIS) of the Spanish Government (FIS 97/0024, FIS 97/0662, BAE 01/5013), International Union Against Cancer (UICC), and Yamagiwa-Yoshida Memorial International Cancer Study Grant. The work of EL was supported by Fondazione Veronesi. 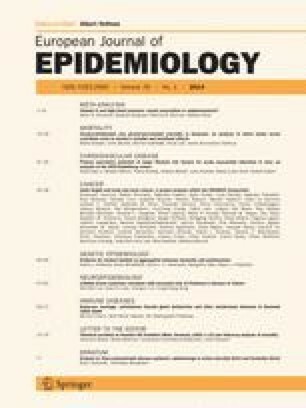 Adult height and the risk of cause-specific death and vascular morbidity in 1 million people: individual participant meta-analysis. Int J Epidemiol. 2012;41(5):1419–33. doi: 10.1093/ije/dys086. Cochrane Handbook for Systematic Reviews of Interventions Version 5.1.0 (updated March 2011). The Cochrane Collaboration, 2011. Available from www.cochrane-handbook.org. In: Higgins JPT GS, editor.